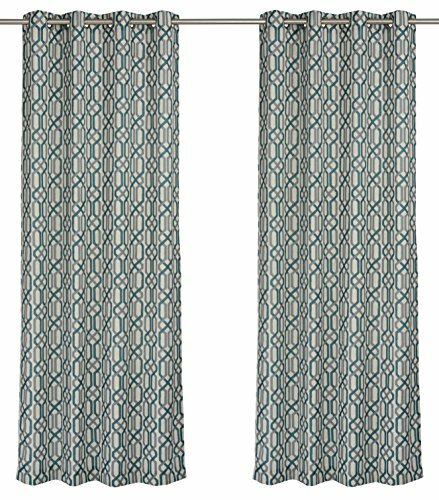 Jump into todays hottest decor trend with Linked curtains by LJ Home Fashions. Interlocking geometric link design available in four (4) colors - green/brown, grey/teal blue, black/grey and silver/grey. All on a ivory ground. Linen blend fabric. Perfect combination of color, design and light filtering curtains. Easy to install. Grommets fits standard size curtain rods. Set includes two (2) grommet top curtains. Each panel is 52x95 inches. 1.6-in grommet diameter. Cold water wash with similar colors. Hang to dry. Interlocking geometric link design. Available in four (4) colors - green/brown, grey/teal blue, black/grey and silver/grey. All on a ivory ground. Set includes two (2) grommet curtains. Each panel is 52x95 inches. 1.6-in grommet diameter. Perfect combination of color, design and light filtering curtains for your home. Easy to install. Grommets fits standard curtain rods. Cold water wash with similar colors. Hang to dry.